New and available from Acrol UK is the Microclene MCP filter which measures 200 x 170 x 150mm (8 x 6 3/4 x 6in). The unit consists of a 35W backward curved fan and motor assembly with an expected life of 40,000 hours. There is a switch and fused power socket on the rear of machine and it conforms to all EC standards. Powder coated for a long life, the filter media is in an easy in/out cartridge, containing a G4 dust filter and an activated carbon filter to remove fumes. The unit is very quiet in use. Simply place the machine on the work table the other side of the work area, and all the fumes and any dust will be dragged away from you. 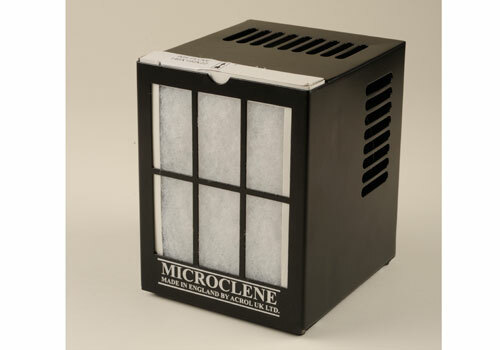 Tests in the USA have shown that timber smoke is carcinogenic and can cause problems in the throat, nose and lungs, so help protect you health with a this Microclene filter.